Big Chico Creek runs ice cold out of the Colby Mountain watershed, over the basalt rocks of the Lassen volcanic shield, and through Bidwell Park and Cal State University in Chico, California. When the temperature hits 117 F in downtown Chico, the swimming holes of Big Chico Creek offer a welcome relief. Big Chico Creek Water is another ice-cold treat for a hot summer day. I first brewed it for a Fourth of July party I went to in Chico. The hostess, my boss, had invited a few of her employees over for the party, but when we got there it became obvious that we were expected to be wait staff for the real guests, who were her neighbors! The most ambitious guy among us went over to the barn and mucked out the stalls. Big Chico Creek Water offered a welcome relief…. Big Chico Creek Water has no fixed recipe. 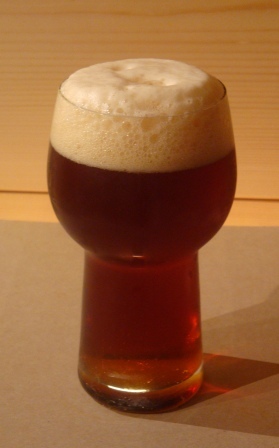 A beer constructed of leftover amounts of specialty grains, it nonetheless retains certain characteristics. It is very malty, dark amber, with assertive hop bitterness and hop aroma, medium-full body and a bitter finish. Its 5.5 to 6% ABV makes it a bit more than a session beer, but still eminently quaffable. The key ingredient is the “Chico” California ale yeast, which produces a dry but malty beer with a nice full flavor accentuating the hops. A typical recipe is about 75% pale malt. Anywhere from 400 to 700 grams of specialty malt for a 20 liter batch provide the amber maltiness. This version uses Cara Munich, crystal blend, Special B, Breiss Extra Special, chocolate, and black malts. Flaked barley contributes graininess and a full head. As with the grain bill, the hop additions vary depending on what is at hand. I have used Nugget, Columbus, Ahtanham, Kent Golding, Challenger, Chinook, Cluster, Cascade, Styrian, Fuggle and Willamette in various combinations. This one is a melange of home-grown hops. A bit of gypsum and sea salt adds an edge to the hop ingredients. This is a great beer if you want to be drinking a full, rich malt-hop extravaganza in less than four weeks. The yeast ferments quickly, drops out fast, and leaves a bottle-ready brew right in the primary fermenter. Two weeks in the bottle and the potion is dry and smooth, though it will develop its complex flavor for six months or more. This entry was posted in Uncategorized and tagged ale, barley malt, beer, chico beer recipe, crystal malt, fermentation, homebrewing, Sierra Nevada, umami.